I just wanted to share a very quick bit of deliciousness with you today. After I had finished making my chocolate grapes the other day, I had some of the cocoa, vanilla sugar and cinnamon mixture left over. I also had some melted dark chocolate left, so in an effort to make sure nothing was wasted, I decided to mix it all together and see what happened! 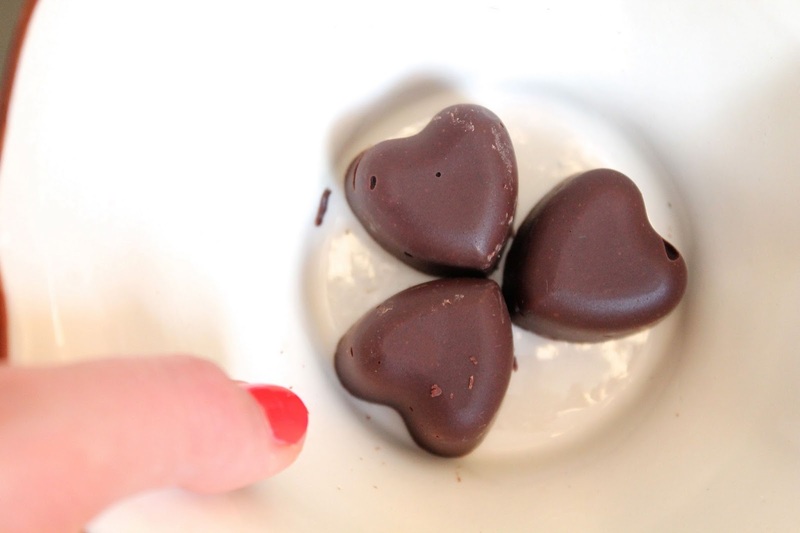 I poured the mix into some little heart shaped chocolate moulds and left them in the fridge to cool. I wasn't sure how they would turn out, after all, you probably don't need to add more cocoa to chocolate... but they were quite yummy! I liked the cinnamon kick, they did have a grainy texture but I liked that too. They melted pretty quickly, but they also got eaten quickly so it didn't really matter! Terrible for you of course! chocolate grapes?! sounds amazing! as well as cinnamon chocolates, two of my favorite things and go perfect together.